Many people have a technological tipping point. That's the point where software, iLife '09 for example, becomes so compelling that it can persuade one to give up personal, specialized, or UNIX geeky ways of doing things and just throw one's entire weight behind a product. iLife '09 did that for me with iPhoto and iWeb. A future installment will cover iMovie and GaragaBand. Sometimes, especially when one has been using computers in a UNIX environment for a long time, he or she will develop ways of doing things that grant great liberty and flexibility. As a result, when a package like iLife comes along, an initial inspection may reveal that Apple has imposed its own way of doing things, flexibility is restricted, and other tools or methods remain useful, indeed hardly replaced by Apple. In my study of iPhoto '09 and iWeb '09, I have reached that tipping point. 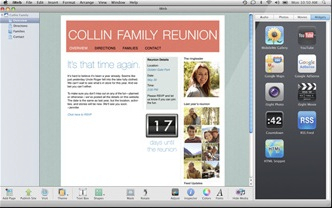 Of course, it would be possible to go into a dry recitation of features, but Apple does a really good job of describing the new features, both in Phil Schiller's Macworld 2009 keynote address and Apple's Web pages dedicated to iPhoto and iWeb. Instead, I'm going to describe my reaction to the product. I used iWeb '06 a lot back in 2006, and found it a bit frustrating. I knew I wanted to drink the Apple Kool-Aid, but the pitcher was mostly empty. Not having any completely satisfying alternatives, not wanting to get bogged down in too much manual work and knowing that if Apple couldn't hit one out of the park, I decided my best bet was to wait for technology to evolve. So the real question in my mind is not whether iLife '09 is a satisfactory set of improvements but rather if components of iLife, namely iPhoto and iWeb, force one over the tipping point. Can one completely commit now to these products without feeling that other tools and methods forge a better path. The answer, for me is yes. 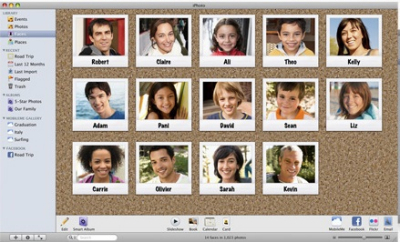 What that means is that US$99 for an iLife '09 family pack is an investment well spent. That's why we read reviews, after all, to arrive at a purchase decision. When I was in San Francisco watching the Macworld Keynote, I got a strong feeling during the iPhoto part that Apple had gone over the top. No one needs to spend that much time mesmerized by photos, adding location data, recognizing faces. Photos are just photos, and keeping them well organized is important. But obsessing over them is a time waster. When I actually started to play with iPhoto '09 myself, I realized that something remarkable was happening. The photos were coming to life. They were being put into context. They were being prepared for public viewing -- whether or not they ever will be, or persona viewing with more fun. It's as if one built a sailing ship out of wood, then quit. Someone else comes along, adds brass rails, lacquered deck and deck house and a cool, 5 meter tall graphic on the white sail. All of a sudden, it's more than just a wooden ship -- it's something to be proud of, to take pleasure in sailing. So while my own family photos won't be of any interest at all to strangers, I can take some special pride in remembering where I took the photos, the circumstances, and enjoy viewing them with my wife in an attractive setting created by iPhoto thanks to the new themed slide shows. That's what iPhoto '09 achieves. The point is not the time wasted messing with geo-tagging and facial recognition and editing. The point is having a tool that increases the satisfaction of viewing precious photos of memorable times, places and people. After all, isn't that why we take photos? To preserve valuable memories. I really liked the new ability to collect images based on faces, not just events, based on facial recognition. I had some mixed results with that, but it was based on some limited testing. Another is the ability to peruse a map with its population of picture pushpins and explore the places I've taken photos. Also, it's easier now to integrate with Flickr and Facebook. I'll admit I was wrong in my initial reaction to Phil Schiller's salesmanship. iPhoto '09 reached the tipping point by bowling me over with joy. In the past, I didn't like the feel of building a Webpage with iWeb, but in the '09 edition, I felt very comfortable. One thing that still infuriates me is that Apple remains devious in the hiding of the iWeb work. Everything created is bundled into package and hidden in /Users/user_name/Library/Application Support/iWeb. The only save function allowed is to basically hit the Save menu item. It's all supposed to be magic, but for those who need more control, of course, there's always something like FreeWay. Another design decision that will annoy many is the lack of an offline site preview in Safari. The only alternative is to publish the site, then go take a look (as far as I can tell). If it's possible to get past these restrictions, then the positives can be enjoyed: WYSIWYG page editing, easy interface to iPhoto, iMovie and iTunes libraries, a boatload of terrific templates, and some handy drag-and-drop widgets like a countdown timer, Google AdSense, RSS feed, Google Maps, a YouTube template and more. The changes in these two apps, iPhoto and iWeb, are sufficient to justify the price of the upgrade if the plan is to get photos better organized, get more enjoyment out of them, and more easily organize them onto the Internet. iWeb still seems frustratingly simplistic in its file management, but at least one can understand Apple's thinking. For those who never engaged this suite of apps before, now is the time - before the further features might overwhelm. For those who've been along for the ride all along, the upgrade is worth the money, just based on these two apps. iPhoto: Takes the process of organizing photos to the next level: a sense of time, place, memory and enjoyment. 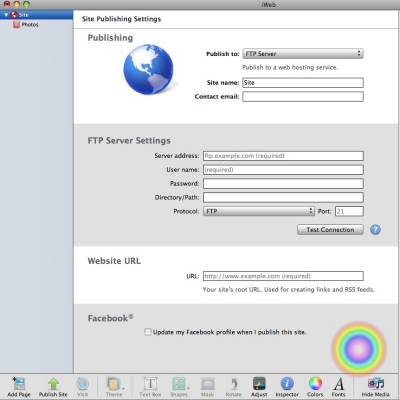 iWeb: Allows FTP/SFTP access to personal Web server. iWeb remains stunningly obtuse about file management. No pointer to docs in brochure included with DVD.